Neighbors NOT ON NEXTDOOR -JOIN US!– Nextdoor is a national, private social network for neighborhoods. 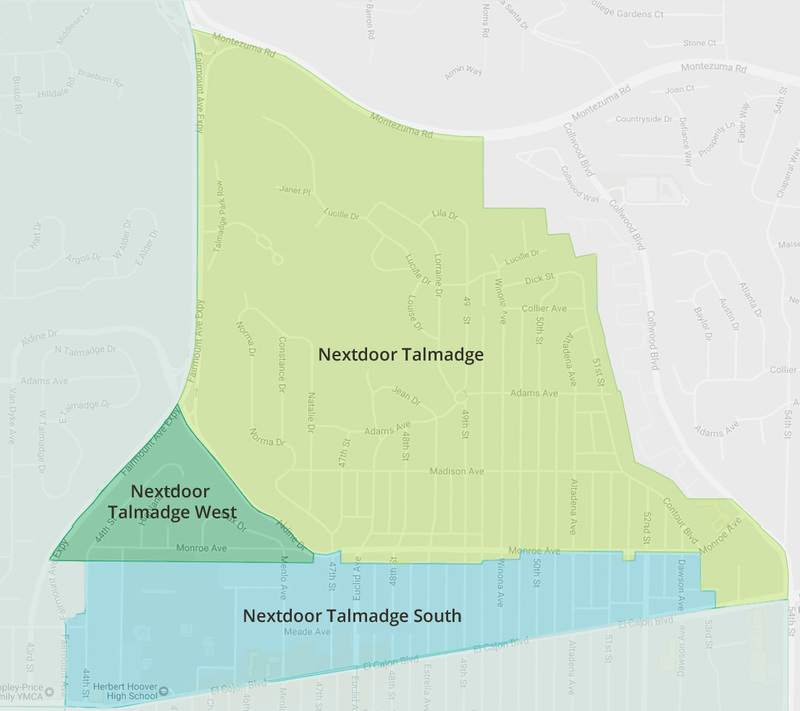 As shown on the Map below, we have 3 Nextdoor Neighborhoods within Talmadge which interact with each other and also interact with Nearby Nextdoor Neighborhoods outside of Talmadge. Unlike the Talmadge Googlegroup which is dedicated to communication with our Reps, Officials, and City Depts, our Nextdoor platform is truly a Neighbor-to-Neighbor forum. Nextdoor is a great way to stay in the know about what’s going on in the neighborhood and offers multiple rescources and newsfeeds for Events, Crime & Safety, Urgent Alerts, business Recommendations, neighbor Classifieds, Lost pets, Neighbor directory & Private Messaging, Service providers, Groups for interests & clubs, and General neighbor discussion. There are so many ways our neighbors can help us, and Nextdoor provides a way to connect with them! On Nextdoor, everyone is empowered to be Neighborhood Watch— Nextdoor combined with our Block Captain program, our Googlegroup, and our acclaimed Talmadge Patrol allows Talmadge to be keenly networked and more effective in crime prevention than other less connected neighborhoods. The 3 Talmadge Nextdoors are: Talmadge, Talmadge West, and Talmadge South. To register, simply select the link where you live or select nextdoor.com if you are not sure. All you need is a verifiable address to join. Using your residential property address, NEXTDOOR will find your Talmadge Nextdoor, validate your address, and prompt you through a quick set-up of your Nextdoor Profile. Though you may optionally display your email address and/or phone# on your Nextdoor profile – YOU NEED NOT – because on Nextdoor, neighbors simply Post on newsfeeds and Private Message with each other!! No more fumbling for email addresses to contact or connect with your neighbors, you don’t need your neighbors’ email addresses, and they don’t need yours when you are members on Nextdoor! WHAT’s THE NEXTDOOR EXPERIENCE? – – On Talmadge Nextdoors, neighborliness & best practices reign. Neighbors are encouraged to help & coach each other to learn and keep up with BOTH their Neighborhood’s current events and Nextdoor’s helpful features & functions. It takes a village, and we are all in this together – we are a neighborhood! NEXTDOOR’s Member Agreement requires members follow general GUIDELINES within their own Nextdoor and across Nearby Neighborhoods. You have settings & controls to limit or expand your activity & info to just your Nextdoor or to share across some/all of the Nearby Neighborhoods – it’s up to you! Nextdoor.com owns & administrates all neighborhood Nextdoors. LEADs (volunteers from the neighborhood) assist Nextdoor in the effort to make the Nextdoor experience mutually beneficial & fun for all members. A connected neighborhood is a happier & safer neighborhood. Thank you to the dedicated volunteer Leads who make our vital Talmadge Nextdoors possible! NEXTDOORs ARE INDEPENDENT. – – Talmadge Nextdoors are independent, NOT administered by any specific Talmadge organizations, and Nextdoor guidelines and member conduct are enforced by Nextdoor Support at Nextdoor.com. ALL Talmadge Leaders are welcome and encouraged to post & utilize Talmadge Nextdoors regarding their organization’s meetings, events, issues, updates, volunteer recruitment, fundraisers, etc. Also, Nextdoor was designed to support Neighborhood Watch (NW), thus the San Diego Police Dept has partnered with Nextdoor and highly recommends every neighborhood utilize Nextdoor for their Block Watch and Neighborhood Patrol programs. • Message your neighbors without the bother of email addresses. Post info within groups or for the whole. Last pitch, here’s a link to the NEXTDOOR Manifesto which expresses the spirit of Nextdoor in a nutshell. Do it – SIGNUP today! Join us, your neighbors, on Nextdoor!